← Will the Women of Country Music Flourish in 2016? Glenn Frey, who passed away January 18 at age 67, did not shine in the spotlight like David Bowie did. His solo career was somewhat successful and had its moments, notably with the 1980s hits “The Heat Is On” “Smuggler’s Blues,” and “You Belong to the City.” But he really excelled as a collaborator. As a founding member of the Eagles, Frey co-wrote and sang on songs that defined a generation, including “Lyin’ Eyes,” “Tequila Sunrise,” and “New Kid in Town.” He and Don Henley rank right up there among the great songwriting duos of rock. The Eagles could not have sold 150 million records without Glenn Frey. As an ensemble member, Frey was often overlooked and underappreciated. Henley’s gritty singing style was more distinctive. Bernie Leadon, Don Felder, and Joe Walsh usually owned the spotlight as guitarists. But between his laid-back vocal style, gentle rhythm guitar playing, and narrative approach to songwriting, Glenn Frey deserves as much credit as anyone for shaping the mellow Southern California rock sound. 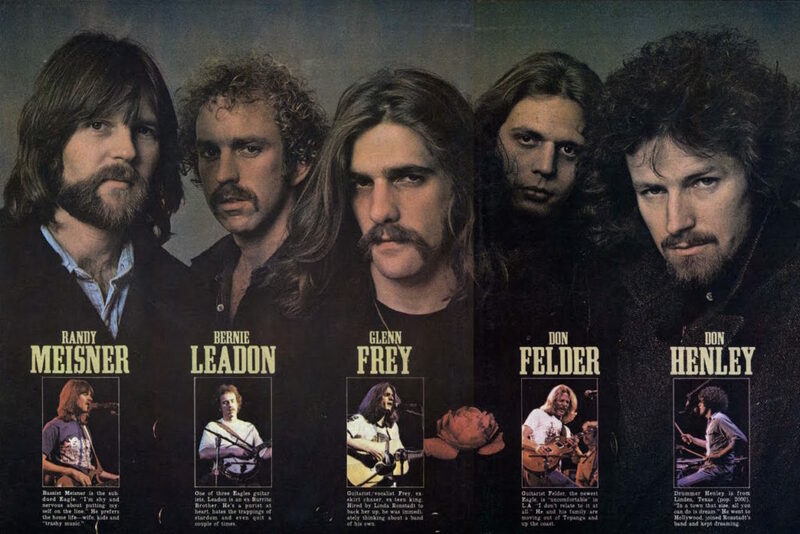 And when the Eagles developed a harder edge to their music, Frey adapted while reminding the group that they were still a powerful force when writing ballads. With each subsequent album, Frey contributed more songs, always by co-writing with other band members, most notably Don Henley. The band’s second album, Desperado, considered a commercial and critical disappointment, yielded “Tequila Sunrise,” which would chart only as high as 64. In time, “Tequila Sunrise” would gain appreciation as a quintessential Eagles song (which is to say, a quintessential country rock song). Frey’s tender, almost boyish sounding voice made the song’s themes of personal betrayal and heartache sound more poignant, and his gentle guitar strumming gave “Tequila Sunrise” a country inflection. Years later, his sweet voice would heighten the sense of loss and sadness in “New Kid in Town,” one of my personal favorites. His lead guitar and co-writing on “I Can’t Tell You Why” added a soulful touch that reflected his Detroit roots. When the Eagles came out of retirement to release one last album in 2007, Long Road out of Eden, Frey’s skillful songwriting helped create a stunning epic with the album’s title track. Throughout the sometimes-turbulent history of the Eagles, Frey was the band’s undisputed co-leader with Don Henley, but he was also an adventurous collaborator. For instance, he and Don Henley developed Don Felder’s initial guitar riff into “Hotel California” literally by driving around southern California together, looking for visual cues to stimulate their thinking, including trips into the desert. They’d drive out to a house in the San Bernardino Mountains and sleep on the floor to clear their heads and let ideas settle in. Their reliance on physical location to inspire them helped produce one of the great songs in rock history. Glenn came over to write one day, and I showed him this unfinished tune that I had been holding for so many years. I said, “When I play it and sing it, I think of Ray Charles — Ray Charles and Stephen Foster. It’s really a Southern gothic thing, but we can easily make it more Western.” Glenn leapt right on it — filled in the blanks and brought structure. And that was the beginning of our songwriting partnership . . . that’s when we became a team. And that’s all it took for the song to suddenly blossom: one brief line nudged Browne to finish what became the first in a long line of Eagles classics. One of my favorite stories about Glenn Frey and the creative process concerns the inspiration for the song “Lyin’ Eyes,” one of the cornerstones of One of These Nights. As Marc Eliot wrote in To the Limit: The Untold Story of the Eagles, one night the band visited Dan Tana’s restaurant in West Hollywood and were hanging out in a banquette watching people enter the bar. According to record executive Bob Buziak, “Someone looked up and saw an older man with an absolutely gorgeous young blond across the room. [Glenn] Frey laughed, turned to us, and said, ‘Look at those lyin’ eyes!” Everyone in the room knew it as soon as he said it. Pens and napkins flew.” Later Frey assembled the notes from the napkins into the song. A lesser team would have laughed off the moment. Not so the Eagles. Pens and napkins flew — and then after the fun night was over, the discipline took over and a song was born. Collaboration can be a messy, fragile process of give and take. As the documentary History of the Eagles relates, collaboration can become corrosive when co-creation falls victim to strong wills and conflicting visions. Collaborating does not mean you have to like the other person. Glenn Frey showed us that successful collaboration happens when partners complement each other’s talents, find flexible, imaginative ways to work together, and work from a position of mutual respect. This entry was posted in Music and tagged David Deal, Desperado, Don Henley, Eagles, Glenn Frey, Jackson Browne, Lyin' Eyes, Superhype. Bookmark the permalink.